In honor of the third anniversary of Google+, we take a look at where the site has been and where its going. 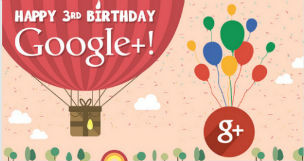 Facebook turned 10 in February, Twitter turned eight in May, and on June 28th Google+ celebrates three years. In honor of Google’s third anniversary, Canadian online marketing firm Driving Profitability for Our Clients, created an infographic to mark the occasion. So what good has G+ done in its relatively short lifespan? Having a G+ account allows users to verify authorship, a great SEO tool which also identifies quality content. The +1 button also acts as a social signal for Google’s search rankings, and Hangouts has brought free video conferencing and webinars to the masses. With the good comes bad, and on Google+ the bad consists of a high volume of inactive users and forced integration with other Google services. Unfortunately, the integration hasn’t gone over well with the public, least of all YouTube commenters. As for the user-base, the average G+ user is a 28-year-old male who works in technology or engineering. The top brands are obviously tech brands, like Android, Mashable and Google’s Chrome. When compared to Facebook, Google lags behind in user count — 359 million vs 1.28 billion — but Rome wasn’t built in three years. To find out what the future holds for Google+ and just how big an impact the +1 button can have if you add it to your site, view the infographic below.